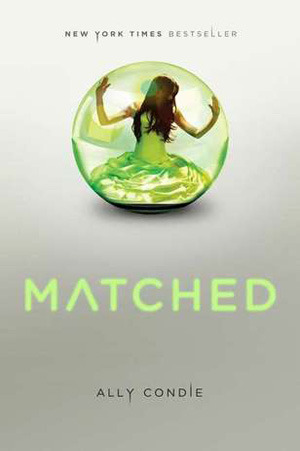 Matched and its companion books know what they are and come right out and say it at the beginning. The books are romance. They don't pretend that this isn't the core of the plot, that Cassia finding her One True Love and being with them isn't the whole point. But there's a thing that happens with this book and the ones that follow it ( Crossed and Reached) that's pretty awesome. They don't let themselves be solely romance books. I had prepared myself for Dystopian Twilight™. I wasn't going to be mad at the books if that's what they were. Okay, I was going to be mad for other reasons, but not because there was a love triangle. Cassia's not the most sympathetic character. In many ways, she's simply A Protagonist. Her story is about the two boys (for a while,) no matter that the world is falling apart little by little around her. She is absolutely focused on This Boy and nothing is going to stop her from being with him. You know what? I respect that. Girl's got her priorities figured out. She knows what she wants. She's gonna go for it. You do you, Cassia. Because Matched is solely told from Cassia's POV, her position in this love triangle that shouldn't be is essentially the whole of the plot. Each successive book picks up another narrator, so by the time the trilogy finishes, we've got three POVs to consider that tell a much more intricate story. The first book is very much about the choice making process in general. The second deals with the lengths to which someone might go in the name of love or what someone's personal limits might be and how those evolve over time. The third? I'm not even sure the third book remembers that it started out at as a romance. Yes, it carries the plot through so there are still those undertones and references to the previous books and that driving force, but The Romance isn't front and center. What Ally Condie does here is prove that just because something is a Romance and bills itself that way doesn't mean that's all it is. Plot threads laid in the first book come to fruition by the third. There are still questions to be asked, but with any good piece of fiction, there always are. I absolutely recommend this series. It has a depth and intricacy that too many things are lacking these days.